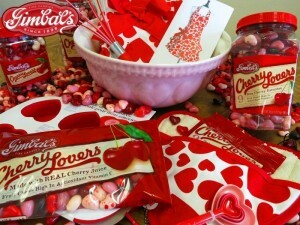 The Grand Prize winner of Gimbal’s “Baking with Love” Sweepstakes will receive 10 pounds of Cherry Lovers heart shaped candies, a gorgeous Valentine retro mixing bowl, an apron & baking mitt, heart shaped baking molds, and many other sweet items to create delicious treats to share and enjoy during Valentine’s Day. Enter now through January 31st at Gimbal’s Facebook page. Click on sweepstakes, like their page and then submit your information for a chance to win. And, here’s a sweet deal….you can get 10% OFF your online purchase at Gimbal’s using code VDAY16. Gimbal’s Cherry Lovers are free of major allergens including gluten, peanuts, tree nuts, dairy, soy and egg, making them a safe treat to enjoy. The chewy candies are also made with real cherry juice and each package features several different cherry flavors including wild cherry, black cherry, cherry cola, cherry cheesecake and more. From old-time favorites to innovative new candies, everything Gimbal’s creates is made with pride in the USA. Enjoy!